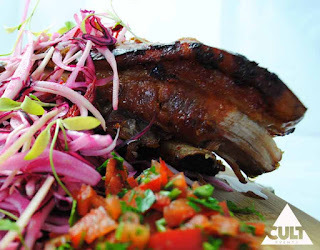 Pisco Fuego return to Pip's Dish in Islington for two nights on 21st & 22nd June. It's a Latin American experience, similar to their two nights in Clapton in Mid May, and costs £40 + fees per head. "Back for round two at PipsDish, Pisco Fuego looks to be burning brighter than ever. Now back with our own cocktail bar with some great drinks on the menu from sharp citrus cocktails through to fine chilean wines and Brazilian beers - we bring to you a very well balanced evening of food, drinks and latin vibes! Inspired by the cuisine and culture of Buenos Aries, Mexico City, Santiago and Lima, Cult Events presents Pisco Fuego, a pop up drinking and dining experience that brings authentic Latin American zing, zest and charcoal grilled goodness to the streets of London. We’ve created an immersive experience that mixes classic asado barbecue cookery with modern street art and live music, all served in a beautifully set-designed venue. Think spit roasted pork, salsa verde, pisco sours and acoustic guitars around an open fire. (Microwaved burritos and Ricky Martin's greatest hits are strictly off the menu). Cult Event’s Chef Ian Ballantyne (http://ian-ballantyne.blogspot.co.uk/), renowned for his Supper Club ‘The Candlestick Maker’ and the team bring years of experience in gastronomy, mixology and bespoke event design to this project, as well as an abiding passion for Latin American culture. Most of our team have travelled widely in the region, and our aim from the outset was to create an event that would live up to our own memories of nights out there, stocked with colour, flavour and keep-the-band-playing-till-dawn energy. Mr. Penfold (www.mrpenfold.com) and other internationally acclaimed street artists are also in collaboration with Pisco Fuego. With Latin American inspired pieces from Mr Penfold, we intend to showcase the artists work alongside a dining experience that will leave all senses reeling."